The podium discussion event was opened by the greeting words of Radmila Schweitzer, Secretary General of the Wittgenstein Initiative. She expressed her wish that the discussion might enlighten some parallels between the lives of Friedrich A. von Hayek and Ludwig Wittgenstein, as well as some important lessons we might learn from them today. After a short introduction by the event moderator, Dr. Barbara Kolm, the first speaker, Dr. Raoul Kneucker presented his ideas. Dr. Raoul Kneucker (Universität Innsbruck, Universität Wien) stressed on the importance of promoting academic dialogue as it was present in the 19th century, among the new generation as well. He expressed his concern over Austria, as a small country, whether still being able to produce and be part of a world famous research scene and to be more visible globally. The evening’s second speaker, Prof. Allan Janik, took the floor. Professor Janik (born in the USA then moved back to Europe; Universität Innsbruck, Brenner Institute) found many similarities in the lives of Wittgenstein and Hayek. They both came from the ultra-elite societies, the exclusive, so called second society. They have been prominent members of the Cambridge academic circles. Hayek was much intrigued and influenced by the philosophy of his far cousin, Wittgenstein to the extent that he wanted to write his biography. The family of Wittgenstein however, seemed to be not too cooperative or supportive in this matter. 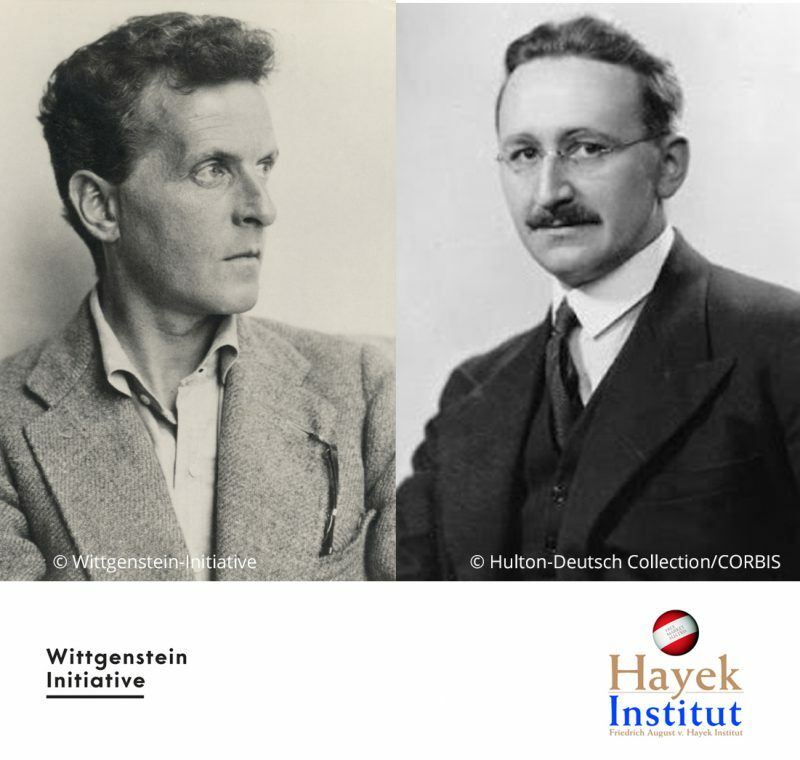 Both Hayek and Wittgenstein had rather curious minds, they have inquired deeper into works related economics/politics/history. Their main drive was what it really means knowing in practice – the limits of scope of knowing. Afterall, they both emphasized the practice over theory. Prof. Marjorie Perloff (Stanford University, University of Southern California, American Academy of Arts and Sciences) took over the discussion by sharing some personal memories of Hayek. Prof. Perloff comes from a family of economists and intellectuals. Her family actually knew Hayek very well, as Hayek paid a visit often in their house. As an important cornerstone of Wittgenstein’s philosophy, referring back to the limits of knowing, she mentioned the idea of “therapeutic scepticism” the art of doubt, to not to be so sure of oneself, which idea was often used later on in political discourses. The Professor remembered back how her family personally knew most of the prominent intellectuals of that era, who often gathered in her home forming various circles, such as the “Mises Kreis” the “Geist Kreis” and the “Wiener Kreis”. Her own father was member of these (mainly men only) circles, they all were rational thinkers and gathered for inter-disciplinary debates. In view of Prof. Perloff, what makes the Austrian School unique that it is not academicized like other school of economics and somewhat Hayek always appeared more pragmatic compared to the German economists. The Professor also agreed that in the olden days, conversations, dialogue and community were more present and evident than today (they had more free time to discuss). Prof. Perloff concluded that both Hayek and Wittgenstein reflect the extraordinary Viennese education of the period. Hayek being very well educated, in various areas, not just in Economics, had a great interest in Wittgenstein’s philosophical principles. The Professor considers them rather interesting, two philosophers who are so much drawn toward a pragmatic discourse. The discussion was continued by Dr. Richard Zundritsch (board member of the Hayek Institute) who shared with the audience his family ties to Hayek (his grandfather was the brother of Hayek), he used to know him when he was a little child, thus he could convey a lot of personal memories. He stressed on the importance of discussion culture which was more part of the society in the past, including inter-disciplinary discussions. In his opinion, the discussion culture should be re-introduced to the younger generations in Austria. Finally the last speaker of the event, Prof. Lothar Höbelt (Universität Wien) took the floor. “the conditions of excellence” – as an example in Germany the academic thinkers on the universities are very much supported and promoted as in contrast to Austria. Before the Q&A session, the Speakers added some further comments. Prof Janik told an anecdote on being too tolerant and gentlemen in intellectual discussions in the past, however Prof. Perloff disagreed. She mentioned as an example the heated debate between G.E Moore, Keynes and Wittgenstein or in general between the various economists. Dr. Richard Zundritsch remarked that the university system was of better quality in the past. Dr. Raoul Kneucker added his concerns about which generation will carry on the culture of discussion in a democracy. Prof. Lothar Höbelt expressed his criticism toward the present university system as well. The Podium discussion was followed by a Q&A session, where we could hear a lot of constructive comments and remarks from the audience, mainly on the topic of education as well as on Friedrich Hayek’s work, the Road to Serfdom.